Looking for Schneider Electric / Square D products? Get a quote fast. There from earliest stages of electricity, Schneider Electric’s roots go as far back as the Industrial Revolution. With a deep commitment to research and development, Schneider Electric is committed to building forward-thinking, sustainable electrical solutions. Schneider eventually bolstered their portfolio by acquiring Squared D in 1991. 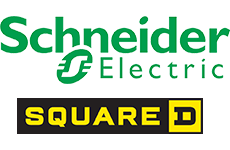 Founded in 1902 as Detroit Fuse and Manufacturing, Square D initially specialized in fuses and fuse switches before ultimately becoming a leader in power distribution solutions alongside Schneider Electric. Today as one unit, they manufacturer some of the most reliable circuit breakers, panelboards, transformers and disconnects in the industry. Through an in-depth understanding of how electrical distribution systems and their components function, Square D and Schneider Electric build electrical solutions that simplify and streamline the distribution of power. From engineers to contractors to distributors like Bay Power, Square D circuit breakers, transformers, panelboards, busway, fuses and safety switches are widely recognized as being exceptionally reliable and efficient. Available with current ratings that range from as low as 100A to as high as 5000A, Square D manufactures both copper and aluminum busway for a flexible power distribution solution. Outfitted with their proprietary Micrologic® technology, Square D circuit breakers are available across most amp and voltage ratings for a variety of applications. Choose from Square D molded case circuit breakers, Square D mini circuit breakers, vacuum circuit breakers and more. Square D carries both NEMA rated and IEC rated contactors to meet all your installation requirements. They manufacture both definite purpose and general contactors across a number of current ratings. Build a custom electrical control solution to meet your individual motor control needs with top quality, authentic Schneider components in our UL508a-certified shop. From pump control panels to VFD control panels, we can do it all. Low voltage electrical unit substations, medium voltage electrical unit substations, Square D by Schneider’s got it all. Choose Schneider for a flexible and reliable substation. From polycarbonate enclosures to metallic and stainless steel enclosures, Schneider carries enclosures of all sizes and materials to meet a variety of environmental standards and demands. For efficient and safe circuit protection and power distribution, Schneider manufactures fuses of all ratings, types and configurations. Welcome to Schneider Electric, home of the industry-leading Square D QO load centers and the residential Homeline load centers. Protect your motor with a manual motor starter from Schneider. Available in a variety of configurations and ratings to meet all your requirements. Complete your Square D motor control center with the appropriate MCC bucket. Available in a number of standard sizes and configurations. You shouldn’t have to choose between ruggedness, dependability, and innovation. And with Square D motor control centers, you won’t have to. Take your pick from Schneider’s extensive portfolio of Square D motor starters. Whether definite purpose or general purpose, Schneider carries starters that meet either NEMA or IEC standards. Choose from an impressive lineup of thermal overload relays and electronic overload relays. Available in a selection of type classes, Schneider’s overload relays can be manually or automatically reset. From feeding large motor loads to handling lighting and appliance branch circuits, Square D NQ panelboards are some of the most convenient and versatile. Square D carries both power and lighting panelboards. Choose from Schneider’s unique selection of push button switches and pilot devices. Available in most standard sizes and types, both maintained and momentary. Automate your system cycles with relays and timers from Schneider Electric. Protect your motors from everyday wear and tear. From simple machines to heavy duty machinery, Schneider’s soft starter portfolio has got something for everyone. Count on Schneider for all your low and medium voltage distribution switchboard solutions, available in a number of NEMA rated enclosures. Metal clad switchgear, low voltage switchgear, medium voltage switchgear - Schneider’s got it all. Current ratings range anywhere from 600A to 4000A. Square D by Schneider carries both automatic and manual transfer switches. Manual transfer switches come in 30A, 60A and 100A ratings, while Square D automatic transfer switches start at 100A and can go as high as 5000A. Choose from Square D dry type transformers, Square D buck boost transformers, low voltage transformers, and more. Square D voltage transformers are divided into one of their 3 proprietary categories: 450R, 460R, or 470R. Low voltage and medium voltage VFD’s are the core of Schneider’s drive offering. Perfect for both general duty and heavy duty applications, depending on the model. Have any old or unused Schneider Electric / Square D products lying around? Don’t get rid of them just yet. While we stock a wide range of quality electrical products and solutions, both new and reconditioned, we also buy back your unwanted equipment. So, before deciding what to do with your old Schneider Electric / Square D products and components, have one of our expert technicians take a look to see if we can save a few parts, save the environment, and save you some cash. Great service shouldn’t end after the purchase. We pride ourselves on the relationships we build with our customer-first mentality and the quality of our Schneider Electric / Square D products and components. That’s why we offer a 1-year replacement warranty on all of our electrical products and solutions from the top manufacturers. Because when you buy with Bay Power, you buy with confidence. We are proud to stock a variety of competitively priced, new and reconditioned components from the leading manufacturers of Schneider Electric / Square D products. Thanks to our extensive inventory of Schneider Electric / Square D products and components, our resourceful and expertly trained staff will always be able to get the products that you need. Through our extensive network of suppliers, we are able to carry and acquire a huge variety of electrical products and solutions, so chances are if you need it, we can get it. Bay Power’s priority is providing you with reliable, high quality electrical hardware. That’s why our mission is to make sure our reconditioned electrical products and solutions function as perfectly as the day they were built. Because while the quality is high, the cost of Schneider Electric / Square D products shouldn’t be. Our selection of new surplus Schneider Electric / Square D products may not arrive brand new in a box, but they function just as well, and have never had electricity run through them. All of the quality, none of the packaging, always with our 1-year replacement warranty.